Place this Sony in a decent position and there's no doubting it will deliver loud, proud and room-filling sound well beyond what its price point suggests. And that's what's important from a Bluetooth speaker: quality sound rather than design fads. 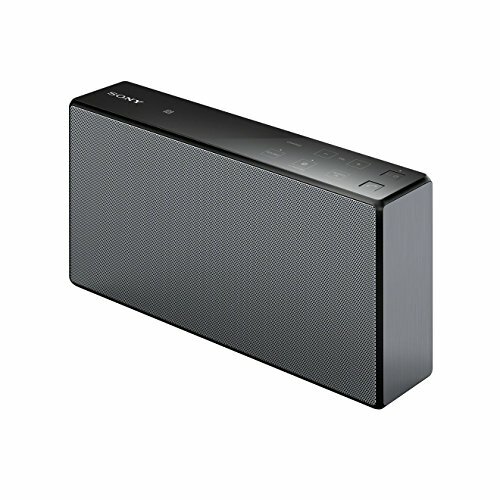 It can so often be a gamble when going to buy a Bluetooth speaker such as the Sony SRS-X55. With so many makers in the market - some good, others bad - there's always the question as to whether diminutive size will bring big sound. With the Sony SRS-X55 that's certainly no issue, but with its simple oblong design, has the Japanese giant missed a trick by not exploring omni-directional sound and other design trinkets as so many similar-price competitors do these days? When we first opened the SRS-X55's medium-sized product box, we were pleasantly surprised by how small the speaker itself is. Face-on it's roughly 220 x 120mm, and at a smidgen over 50mm deep it's easily portable. We've had the speaker plonked onto our desk for a number of days, often plugged into the mains as to not worry about the battery, where it's been busy busting out the tunes (although when unplugged it's lasted for a full 9-hour day at work before needing to be plugged in again). The SRS-X55's design is fairly simplistic though. But the quality of the finish can't be called into question; although it's all plastic, the metallic finish gives a sheen that elevates what could look cheap into something more premium in appearance. But the flush touch-gesture square buttons on top - comprising volume up/down, Bluetooth, Audio In (for 3.5mm input) - alongside the pair of depressible on/off and speaker phone buttons just appear a bit simple. They're inoffensive, but everything's just a bit, well, square. Bluetooth pairing has been near immediate and no problem to setup. However, should you accidentally hit the Audio In button then we've had issues quickly pairing back to Bluetooth, it's not been as simple as selecting the source again every time. Keep an eye on those flailing fingers! But lt's face it, you'll buy a Bluetooth speaker to listen to music first and foremost. And in this department the SRS-X55 is quite outstanding. The first thing that hits you is how much bass burbles from this small speaker. Given its 50mm depth, the 58mm mini woofer and dual passive radiators inside do a grand job of kicking out the low-end frequency. The fixed grille to the rear means you don't see any vibration, although your desk might well feel and sound out vibrations. We've been listening to Arcane Roots, where the bass guitar riffs are clear and defined without being overpowering, while even pop music and some bass-driven underground tunes have fared extremely well. Two 38mm drivers front the system for a clear sound that cuts through the bass with mids and highs all at ample volume. Listening to Bring Me The Horizon's Oh No and Oliver Syke's vocals cut through the mix - although the definition of distorted guitars didn't sound as rich when we compared it to our go-to Mordant Short office speakers. Still, for a £140 speaker this Sony sounds great. There's a caveat to this quality of sound, though: placement. As we touched upon in the intro, the SRS-X55 is design to go face-on to its listeners, otherwise the delivery of sound isn't as well balanced. We've had to turn the speaker sideways or raise it to ear level to get the best results. Perhaps a tilted design to fire sound upward from a desk position or, as with so many competitors such as Ultimate Ears, a cylindrical or multi-directional speaker concept for truly room-filling sound might do the trick. But then again, that's just not what the SRS-X55 is and, you know what, we don't care - because it sounds great, and that's what's most important. Sure, its design might not be the most exciting, and it's not at all the best for omni-directional sound (like, say, the UE Boom 2), but that's all that really marks it down.